BLDGBLOG: Weather Architects of the Year 2050 A.D.
[Image: "Whirlpool" (1973) by Dennis Oppenheim]. Artist Dennis Oppenheim's "Whirlpool" project, from the summer of 1973, sought to create an artificial tornado on the bed of a dry desert lake in Southern California. It was intended as a "3/4 mile by 4 mile schemata of tornado," the above image explains, "traced in [the] sky using standard white smoke discharge from aircraft." 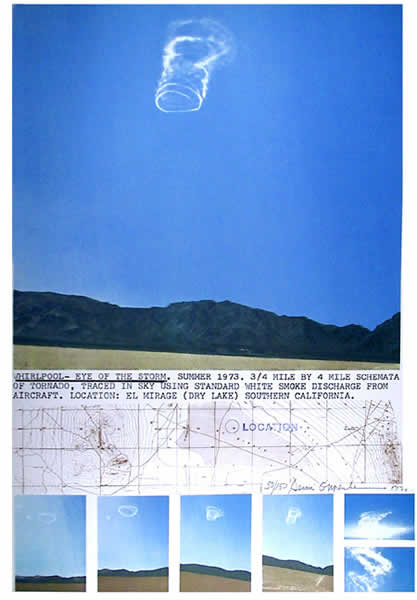 Employing one of [Oppenheim's] characteristic quasi-scientific methods, the piece was created by issuing radio instructions to an aircraft which discharged a liquid nitrogen vapor trail. The aircraft began by flying in revolutions measuring three quarters of a mile in diameter. Subsequently the pilot was instructed to repeat this manoeuver but, with each revolution, he was made to reduce the size of the diameter of the circle and lose height—and it is no mean feat controlling a plane according to these specifications. The operation had to be repeated three times before the desired whirlpool effect was achieved. In a short story called "The Cloud-Sculptors of Coral D," J.G. Ballard envisions a tropical atoll where the residents have learned to "sculpt" clouds in the sky, listening to Wagner over loud speakers and using specially engineered gliders and flying techniques. "Lifted on the shoulders of the air above the crown of Coral D," Ballard writes, "we would carve seahorses and unicorns, the portraits of presidents and film stars, lizards and exotic birds. As the crowd watched from their cars, a cool rain would fall on to the dusty roofs, weeping from the sculptured clouds as they sailed across the desert floor towards the sun." They are part aesthetic object, part weather system. [Image: "Column" by Anthony McCall, courtesy of Creative Review]. Both of these came to mind this weekend when I read that artist Anthony McCall is planning to create something called "Column" in Liverpool, to coincide with the London 2012 Olympics. It will be "a spinning column of cloud a mile high," as Creative Review describes it, "visible across the North West region throughout the Olympic year." 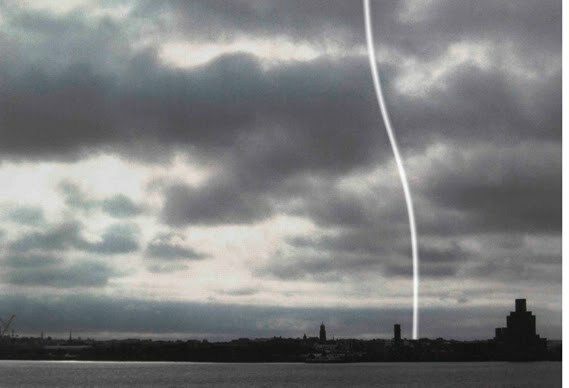 Made of cloud and mist, this "swirling micro-climate" will be "created by gently rotating the water on the surface of the Mersey and then adding heat which will make it lift into the air like a water spout or dust devil." We'll have to see how it actually works out, of course, but the idea that cities might soon deploy large-scale specialty weather-effects—that is, permanent climatological megastructures—instead of, say, Taj Mahals or Guggenheim Bilbaos as a way of differentiating themselves from their urban competition is a compelling one. The future weather-architects of 2050 A.D. In-house climatologists spinning noctilucent clouds above Manhattan. Could be lovely accompanied by Diller + Scofido's Blur Pavilion. reminiscent of walter de maria's "lightning field" in new mexico. i really like this interpretation of land art. it serves to broaden what an "earth work" can consist of or look like. we've been manipulating and altering the weather for almost a century now. might as well incite some aesthetic investigation in the process.